Hawkesbury trainer Scott Singleton is headed for his best ever season at home, and has given an interesting pointer to the pick of his trio of runners in a TAB quaddie leg there on Thursday. Singleton prepared eight winners on his home track in both 2014-15 and 2015-16 and has already trained that number in the first eight months of the current season – only one short of last season’s nine-winner benchmark. With 25 winners overall this season, he is also in line to achieve another personal benchmark by bettering his best of 34 in 2014-15. Singleton takes a team of seven to tomorrow’s meeting, and three of them – Madam Juror (Christian Reith), Staggering (Bobby El-Issa) and Yorkshire Rock (Travis Block) – all contest the All State Shopfitting Class 2 Handicap (1600m). Though Staggering and Yorkshire Rock were last-start Bathurst winners, his preference is for Madam Juror, whose two victories earlier this season were at 2350m (Newcastle) and 2100m (Orange) and kicks off a new campaign at the “mile”. Whereas Madam Juror is a five-year-old, her younger stablemates are three-year-olds. “I actually had Christian (Reith) booked for Staggering as I’m keen to try her at 1600m, but had to do a bit of shuffling as he really wanted to ride Madam Juror,” Singleton explained this morning. “Christian was on her in a recent Hawkesbury trial (she finished second to Typhoon Monaco over 1250m on March 19) and said she gave him a good feel. "Madam Juror is going really well, and I’m sure she will be strong first-up at the 1600m.” The Tickets mare hasn’t raced since beating eight rivals in a Class 1 Plate (2100m) at Orange last December on soft ground. Singleton has taken blinkers off Staggering – successful at two of her five starts – for what almost certainly will be her final outing this preparation. “She has done a good job winning twice at Bathurst over 1300m and 1406m at only her second preparation, but I doubted she would settle well enough wearing blinkers to manage the ‘mile’,” he said. Singleton’s trio contest the second leg of the TAB quaddie, and he also has topweight Itasca (Reith) in the third leg, the Royal Hotel Richmond Benchmark 63 Handicap (1400m). Another of Tickets’ progeny, the four-year-old hasn’t raced since mid-November. In a seven-start campaign, he won consecutive races over 2000m at Hawkesbury and Bathurst in October, carrying 59kg on each occasion. Itasca goes up to 60.5kg tomorrow, and has had the benefit of a 1000m trial at home on March 19. Singleton’s other Hawkesbury representatives are Triksing (Block) and Decapitor (Deanne Panya) in the Peter Kelly Flooring Maiden Plate (1500m), and first starter Allandale Raider (El-Issa) in the Bright Print Group Maiden Handicap (1100m). “Triksing would be the pick of my pair in the 1500m Maiden,” he said. “I thought he ran okay when fourth first-up over 1300m, and the extra 200m suits. Decapitor was balloted out of a longer race last time, and I’ve had no option but to run him here to build him up to get over more ground. Singleton is looking ahead to the $175,000 Group 3 Godolphin Crown (1300m) with Shazee Lee at Hawkesbury’s stand-alone meeting on April 28. 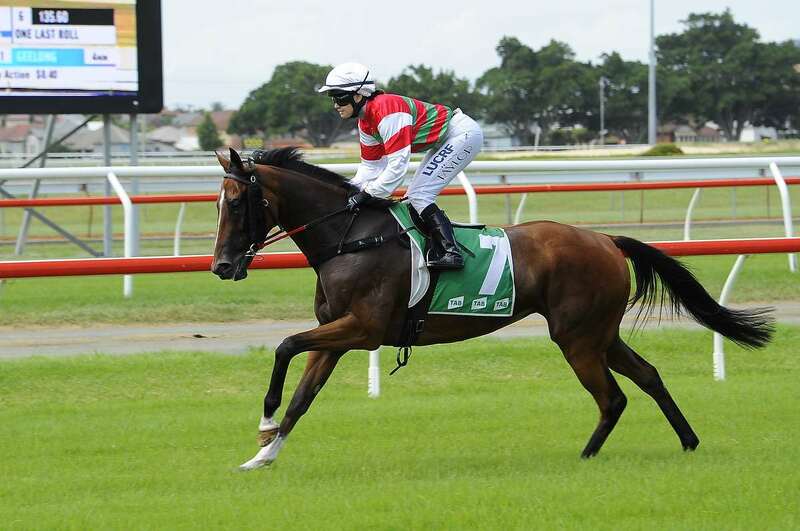 He clinched a breakthrough black type victory at the same fixture last year with her in the Group 3 Blacktown Workers Club Hawkesbury Guineas, and she has come back with two impressive trials at Hawkesbury and Randwick (the latest when third to Redzel and Lanciato over 1000m). He also has a promising Tavistock filly in Monday’s Rosehill Gardens runner-up Stock Up, but has not yet committed her to running in the 1400m Guineas on April 28 until she has another start in a 3YO Fillies Maiden Plate (1300m) on April 18 and hopefully clinches her first win. The rail is in the TRUE position for tomorrow’s meeting, and the track this morning was rated a Good 4 with a penetrometer reading of 4.94. A total of 14mm of irrigation has been put on the track in the past week, but nil in the last 24 hours and there has been no rainfall either. RACE 1: GIVEN TIME, Triksing, Jewel Of Honour. RACE 2: MASTERATI, Lakota, And So It Goes. RACE 3: MILITARY ACADEMY, Extreme Measure, Cortesta. RACE 4: SOKUDO, Federation, Guerrier. RACE 5: MR PLOW, Fourth Protocol, Spin Bowles. RACE 6: LIVE AND FREE, Staggering, Yorkshire Rock. RACE 7: ITASCA, Kravchenko, Appetizing. RACE 8: PLAYARD, Ballet Rose, Fifth Affair.